It’s always fun to look at old menus. I think eating out was a much bigger deal in those days. It looks like an a la carte menu and the prices are amazingly low. I spotted chow-chow. My grandmother used to make that, a pickled vegetable relish. Now, that’s a menu! A friend of mine posted a menu from the ’50’s that was like that. Those prices are low and there is quite a lot of choices. 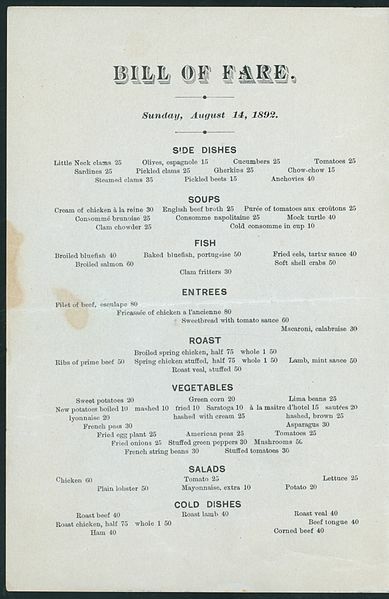 I don’t think we see menus called ‘bill of fare’ anymore. I appreciate the photos of spring springing. Thank you. I like that succulent that has the stalk coming out of the center. The succulents are really interesting plants. Glad Kate is better. What a ‘plus’ that she enjoys cooking. Hope your eye gets back to normal soon. I enjoyed seeing all your beautiful yard plants. Enjoy the spring! I like the abundance of veggies on that menu and the star shaped flowers. The plants on the bottom middle photo remind me of baby birds with mouths open. I hope your eye gets all better soon!